We have several events I’d like to get on your radar, including performances, competitions, and shows. And as always, from seminars, to competitions, demo’s and other activities, you won’t want to miss out on the action at CMAA! New Fashion- CMAA's New Look! Please note that all classes will be cancelled Monday 9/3/18 for Labor Day! We will be holding our quarterly Sash Test on Sunday, October 14th at 10:30am. If you are not sash testing you are still encouraged to come participate and support your teammates (no charge of course). You know exactly what we will be testing but if you have any questions, check the Sash Requirements page on the website and feel free to clarify things with me during class. If you are unsure whether or not you (or your child) are ready to test, please speak with me before or during class, via email at AlbanyCMAA@gmail.com or by phone (518) 755-7512. Remember, you will not “get” your sash at CMAA – you will EARN it! There is a big difference. It’s important you (your child) learns the value of their sash- the value of hard work! Let’s stay focused and step up our training so we’re fully prepared for the test! Great experience competing at the North East Open - Martial Arts Tournament & Showcase! Though we were a small team, we had huge success. With 7 competitors competing in a total of 15 events we took a total of 5 Golds, 5 Silvers and 2 Bronze! The tournament, was very well organized with events running smoothly. (Kids were done by 12:30 and our adults finished by 3pm). Considering this tournament is located in Albany, I can't recommend it enough. I look forward to promoting this earlier next year and really putting together a full-scale competition team! Competition. We learn important lessons when we compete and martial arts offer all types of competitions for those who seek to benefit from competition experience. From small tournaments to national and international tournaments, individuals can choose to compete in either individual forms or various types of sparring. From goal setting to developing the confidence to perform in front of a large group, it doesn’t matter which events they choose, the benefits remain numerous. From learning to deal with loss and disappointment, to winning gold, qualifying for a national team spot or competing internationally, important life lessons will be learned. Additionally, achievements can also be listed on student’s CV’s. Please help CMAA go green! Throwing out hundreds of paper cups a week we have decided to ask students to bring their own water to class. New CMAA water bottles will be available to purchase for $5, though any water bottle is OK of course! Regular bottles of water can always be purchased during class for a dollar. Thank you! This year’s Festival of Nations will be scheduled for Sunday, November 4th. Stay tuned for details about a demo by CMAA as part of the China’s performance! This is always a great opportunity for CMAA to showcase the results of our hard work and the beauty of Chinese martial arts to the local community! Note: All students ranked light brown sash or higher are welcome to join our performance team perform! You are required to attend the demo team training sessions as our performance routines are ever changing to reflect our students developing skills and abilities! Please inquire with Shifu if you are interested in this opportunity! Check out some of the highlights from last years demo! Why Tai Chi is Actually Worth Your Time? CMAA will be upgrading our fashion! 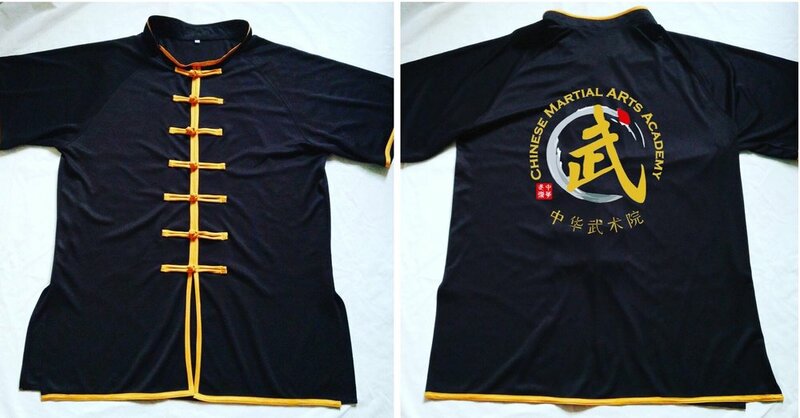 If clothes make the man, then a uniform this stylish will definitely help you achieve martial arts mastery. As we continue to work with our partners in China, we are looking to receive our uniforms in October. These uniforms can be worn to practice, demo's, performances, and competitions! The projected cost is $36. Please note, tops will be required for Kungfu students to Sash Test and while not required for Tai Chi students, for those of you who expressed interested you are more than welcome to don this stylish ensemble as well. As usual please stay tuned for more exciting action at CMAA! Labor Day - Classes Cancelled (Monday, 9/3).